are you shallow and insecure? egocentric? imbued with a false sense of your importance and popularity? maybe even, well let’s be fair, a jerk? okay, the clinic term is narcissist and it’s a disease that is so tragic and profound that it doesn’t even have a celebrity spokesperson. narcissus was a mythological greek dude who fell in love with his reflection in a lake and died because he just couldn’t tear himself away from the beautiful sight. 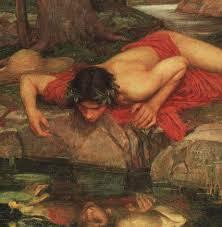 narcissism is a catch all psychological term for anybody who thinks to highly of themselves. narcissism also refers to the personality disorder of any one of your exes. the university of michigan has released a study that concludes that social media sites like twitter and facebook draw in narcissists who want to bolster their fragile egos, control everybody’s great opinion of them, and post about what they are having for dinner. study director elliot panek says that young narcissists opt for twitter while middle aged narcissists (a.k.a. jerks) use facebook. mr panek, there’s ovulate, there’s overvalue, there’s evaluate. unfortunately, there is no :”overvaluate” unless, of course, you have overvalued your . . . oh, never mind. middle aged narcissists, according to this study, choose facebook. slow, stately facebook. okay, well, glad we cleared all this up for everybody. young narcissists and middle aged narcissists . . . we gotta ask. . .
me? i’m on facebook, i’m middle aged, i’m willing to entertain all diagnoses. just in case you’re curious–as near as i can figure out elliot panek is a linkedin social media user. wonder what that means? This entry was posted on Wednesday, June 12th, 2013 at 8:12 pm	and tagged with elliot panek, facebook, narcissism, narcissists, overvaluate, overvaluation, overvalue, social media, twitter, university of michigan and posted in Uncategorized. You can follow any responses to this entry through the RSS 2.0 feed. brett, i think i have to cop to narcissism and i appreciate that others fit the category as well. i recall reading christopher lasch’s culture of narcissism in college and i’m surprised at how prescient he is! totally no judgment. one of the things i wondered is what the university of michigan folks would think of blogging which is, in some sense, the ultimate in designing one’s own universe. and i agree that narcissism is actually a good thing when it is part of a plan to progress spiritually. you and i have a lot in common about our perspectives i think! much love. . .